Albert Gleizes (8 December 1881 – 23 June 1953) was a French artist who lived and worked in Paris for many years. Inspired by the work of Paul Cézanne, he is one of the founders of Cubism, along with Pablo Picasso, Georges Braque and Jean Metzinger. People crowded into our room, they shouted, they laughed, they got worked up, they protested, they luxuriated in all kinds of utterances. We laugh out loud when we think of all the novices who expiate their literal understanding of the remarks of a cubist and their faith in absolute truth by laboriously placing side by side the six faces of a cube and both ears of a model seen in profile. A terrible thing has happened to me: I believe I am finding God. To understand Cézanne is to foresee Cubism. Henceforth we are justified in saying that between this school and previous manifestations there is only a difference of intensity, and that in order to assure ourselves of this we have only to study the methods of this realism, which, departing from the superficial reality of Courbet, plunges with Cézanne into profound reality, growing luminous as it forces the unknowable to retreat. Some maintain that such a tendency distorts the curve of tradition. Do they derive their arguments from the future or the past? The future does not belong to them, as far as we are aware, and one be singularly ingenuous to seek to measure that which exists by that which exists no longer. Let the picture imitate nothing; let it nakedly present its raison d'être. We should indeed be ungrateful were we to deplore the absence of all those things flowers, or landscape, or faces whose mere reflection it might have been. Nevertheless, let us admit that the reminiscence of natural forms cannot be absolutely banished; not yet, at all events. An art cannot be raised to the level of a pure effusion at the first step. If we wished to relate the space of the [Cubist] painters to geometry, we should have to refer it to the non-Euclidean mathematicians; we should have to study, at some length, certain of Riemann's theorems. We do not mechanically connect the sensation of white with the idea of light, any more than we connect the sensation of black with the idea of darkness. We admit that a black jewel, even if of a dead black, may be more luminous than the white or pink satin of its case. Loving light, we refuse to measure it, and we avoid the geometrical ideas of the focus and the ray, which imply the repetition-contrary to the principle of variety which guides us-of bright planes and sombre intervals in a given direction. Loving colour, we refuse to limit it, and subdued or dazzling, fresh or muddy, we accept all the possibilities contained between the two extreme points of the spectrum, between the cold and the warm tone. We are frankly amused to think that many a novice may perhaps pay for his too literal comprehension of the remarks of one cubist, and his faith in the existence of an Absolute Truth, by painfully juxtaposing the six faces of a cube or the two ears of a model seen in profile. Quotes from: Albert Gleizes', The Epic, From immobile form to mobile form, translation by Peter Brooke. Originally written by Gleizes in 1925 and published in a German version in 1928, under the title Kubismus, in a series called Bauhausbücher. The first manifestations of Cubism took people by surprise because their minds, ill-adapted as they are to the idea of movement, are never able, on the basis of what is in front of them, to envisage what is to come. In opposition to the immobile means of expression that the Academy was teaching, these painters threw down like a challenge a mobile expression; to volumes situated in space they preferred the living dynamism of coloured form in evolution. In nearly all the papers, all composure was lost. The critics would begin by saying: 'there is no need to devote much space to the Cubists, who are utterly without importance', and then they furiously gave them seven columns out of the ten that were taken up, at that time, by the Salon. I wish to establish the true history of Cubism whose beginning was not a matter of mere chance, something dependent on a throw of the dice, but clearly linked to that revaluation of all the values of whose absolute necessity no-one in these days can be in any doubt. It was around 1910/11 that everyone, at every level of the social scale, became aware of those apparent eccentricities that were challenging the precarious certainties of the world. And it was uniquely the painting of a group, not of an individual, that was the cause. There is not a canvas of that time that does not foreshadow the overthrow of the foundations on which the human race thought itself firmly established, where it felt itself secure. At the moment when the Ballets Russes were at their height, when the Neo-Impressionists and Fauves had dispensed with the drawing style of the Renaissance because it could not contain the purity of the colour - these humbly painted, angular, grey, ascetic pictures were, really, an unwelcome sight. It was not any upheaval of a geological nature that they prefigured, but a cataclysm in the human order. No tremor of the earth was registered, but a tremor of the spirit that disturbed the intellect of civilised man, too long the slave of his immobilised senses. At last he was beginning to suspect that something dangerous was approaching. All the constructions of this first phase of the youth of the group bear witness to its constant characteristics. The epic imagination is a proof of its esemplastic power. Everything is formal, inventive and arithmetical, therefore rhythmic. The immobile had been changed to mobility. We were still attached to the representational image. We cut into the form, the different angles from which it could be seen, the perspective. The object turned in our hands, we turned round it. We were tortured by this mystery of form. 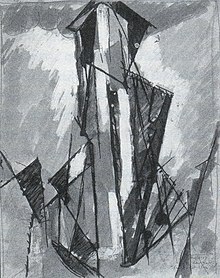 A talented artist, Albert Gleizes, also allowed himself to try a trianguliste representation of the human figure. This is sad, deeply. [In Gleizes' paintings of the crucial year 1910] we see the artist's volumetric approach to Cubism and his successful union of a broad field of vision with a flat picture plane. [...] The effort to grasp the intricate rhythms of a panorama resulted in a comprehensive geometry of intersecting and overlapping forms which created a new and more dynamic quality of movement. In [his article] La Peinture et ses lois ['Painting and its Laws', 1924] Gleizes deduced the rules of painting from the picture plane, its proportions, the movement of the human eye and the laws of the universe. This theory, later referred to as translation-rotation, ranks with the writings of Mondrian and Malevich as one of the most thorough expositions of the principles of abstract art, which in his case entailed the rejection not only of representation but also of geometric forms." This page was last edited on 8 July 2018, at 07:44.